Scientific notation expresses a number as decimal greater than 1 and less than 10 multiplied by a power of 10. In general: a × 10^n where 1 < a < 10 and n is a real number. For example, 2,345,000 is written as 2.345 × 10^6 in scientific notation. To enable scientific notation, tap menu button and tap Settings > Calculator > Number format > Scientific notation in order. 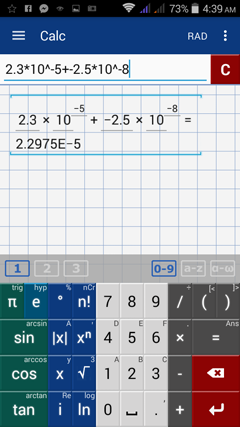 All results will be expressed with "E" denoting " × 10" and the number after E is the exponent. The exponent on 10 also tells you how many times to move the decimal point after the one's digit. 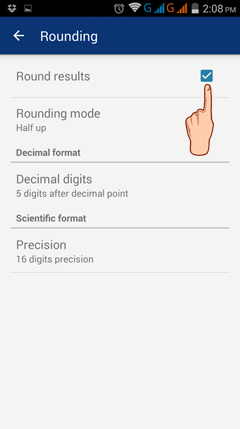 To choose the precision for scientific notation, tap menu button and tap Settings > Calculator > Rounding > Precision in order. Precision goes up to 16 digits. 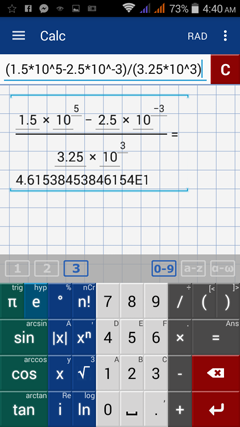 To perform operations using scientific numbers, type them as they appear. Use the exponent key (x^) to enter exponents. If you decide to switch out of scientific notation, tap menu button and go back to Settings > Calc > Number format > Auto in order.